Südbahnhof South Station was Vienna’s largest railway statuin. It closed in December 2009 and reopened as Hauptbahnhof (central station). 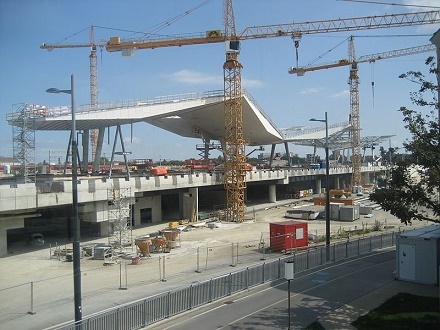 The new Hauptbahnhof was fully operational at the end of 2015. Hauptbahnhof has international trains to Frankfurt, Milan, Munich, Praque, Venice, Warsaw and Zurich and several other foreign cities. It takes 16 minutes with the City Airport Train (CAT) to Central Station. Westbahnhof has been renovated in 2008-2011 and transformed into a commuter train station. Westbahnhof is located on shopping street Mariahilferstrasse. There is a bus service to Vienna Airport (3 buses every hour). Busy station because two metro lines (U3 and U4) and the S-Bahn trains S1/2 have a stop here. Bahnhof Wien Mitte is also the terminus station for the airport train CAT. Near by is the city center of Vienna. It takes 2 stops to Stephansplatz or Karlsplatz and only 1 stop to Schwedenplatz. Praterstern is located in the north of the city. The famous ferris wheel (Riesenrad) is close to the station. With the metro line U1, it’s three stops to Stephansplatz. The S-bahn 1/2 connect Praterstern directly with Bahnhof Wien Mitte and Meidling Station. Meidling is a district in Vienna. Many residential workers take the train from this railway station. It is one of the busiest train stations in Austria with 45.000 passenger daily. When the South Station was closed (2009-2015) Meidling Station get even more passengers.